Clotilda Douglas-Yakimchuk couldn’t have asked for a better birthday gift. Health issues prevented her from attending the Order of Nova Scotia investiture ceremony last November. The disappointment, however, quickly subsided upon learning that a special presentation ceremony was arranged for January 11 – her 87th birthday – to receive the province’s highest civilian honour. For the Nova Scotia Hospital School of Nursing (NSHSN) first Black graduate, it was the best anniversary present. The recognition also allowed the octogenarian to deeply reflect on her immigrant parents, who were her heroes, journey in Canada and the challenges they faced while assimilating in a new country. She is part of a generation of first Barbadians that went to work at the integrated steel plant in Whitney Pier. Arthur and Lillian Coward arrived in 1914. She needed plenty of resolve to deal with racial exclusion while trying to enter nursing school. The thrill of becoming the first Black to graduate from the NSHSN in 1954 was soon tempered when White patients brought their unhealthy prejudices and biases to Nova Scotia Hospital in Dartmouth. 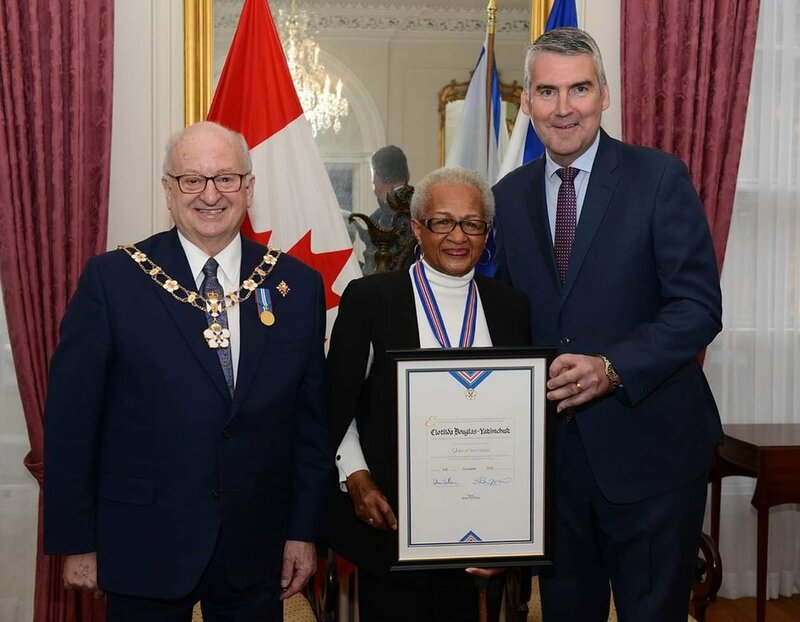 The gesture was very significant to Douglas-Yakimchuk who was recognized with a Harry Jerome Award in 1991 and is the only Black to preside over the Registered Nurses Association of Nova Scotia which is now the College of Registered Nurses of Nova Scotia. “It reminds me how people can change when you look beyond colour and get to know someone,” she said. The Royal Doulton set takes pride of place in Sharon Douglas’ Mississauga home. She’s Douglas-Yakimchuk’s daughter. Finding nursing uniforms fashionable and professional inspired Douglas-Yakimchuk to pursue that career. Douglas-Yakimchuk was the admission unit head nurse for three years up until 1957 before heading to Grenada where she was the director of nursing for nine years at the island’s psychiatric hospital. 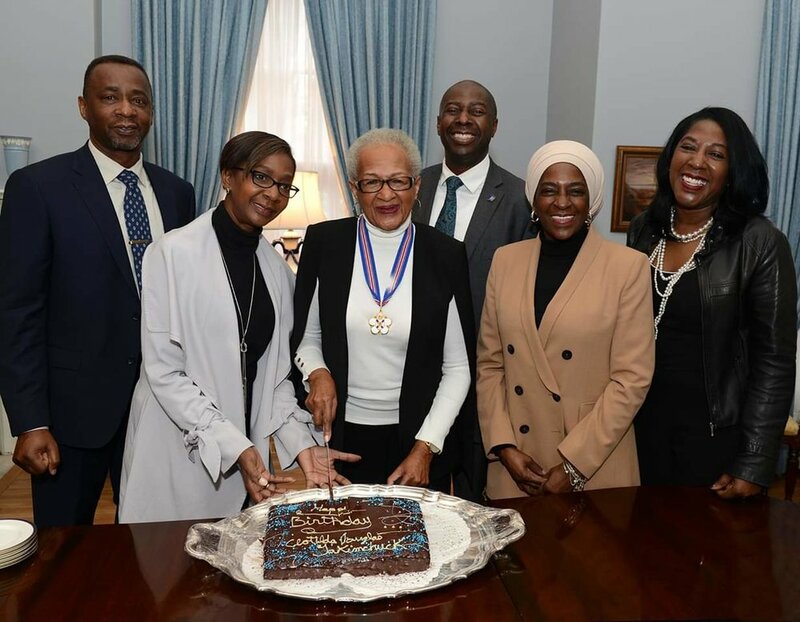 After graduating from the NSHSN, she met and married Grenadian-born Benson Douglas who wanted to return home to make a contribution after graduating at the top of his class in 1954 from Dalhousie University with an undergraduate degree in law. He was chosen to deliver the valedictory address and graduated the following year with a Master of Laws. While at the psychiatry hospital that was bombed by mistake during the United States invasion of Grenada in 1983, Douglas-Yakimchuk expanded the outpatient psychiatry clinic before returning to Nova Scotia with her husband in 1967 and becoming a staff nurse at the Sydney City Hospital. The couple separated and Douglas went back to Grenada and became a judge before his death in January 1975. She spent 24 years at Cape Breton’s psychiatry hospital, serving as nursing supervisor for five years and the first director of staff development for 19 years before being appointed director of educational services at the Cape Breton Regional Hospital. She held that position for two years. Douglas-Yakimchuk was also the president of the Cape Breton Council of Senior Citizens & Pensioners, a founding president of the Black Community Development Organization that provided affordable housing in low-income communities and focussed on education and culture, and a key contributor in the compilation of ‘Reflections of Care: A Century of Nursing’ that tells the stories of Cape Breton nurses who graduated from the hospital-based school of nursing. Proceeds from the sale of books were used to create an award for Cape Breton University (CBU) nursing students. Nearly three decades after being part of a committee that vigorously lobbied for a nursing degree program at CBU that admitted its first class in 2007, the university awarded the trailblazer with an honorary doctor of laws degree in 2010 alongside students graduating from the nursing program she helped create. Douglas-Yakimchuk, whose second husband -- two-term Sydney Ward 5 alderman Dan Yakimchuk -- died in 2011, broke the colour barrier at NSHSN six years after Ruth Bailey and Gwyneth Barton became the first Black women to graduate from a Canadian nursing school. They were trained at Halifax Children’s Hospital. Bernice Redmon, who had to go to the United States to acquire her nursing certification, was the first Black nurse to practice public health in Canada when she joined the Nova Scotia department of public health in 1945.